How has The Mirage Hotel and Casino continued to thrive on the Las Vegas strip for more than 25 years? Aside from the steady influx of tourists and party-goers, much of the reason that this monstrous development is still doing so well is because they are constantly refreshing their image by offering new attractions. 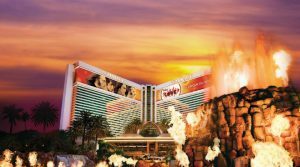 Although it primarily acts as a luxurious hotel and casino, The Mirage is well-known for offering a large selection of extravagant restaurants, entertainment and nightlife venues. In March 2016, the newest addition by Clique Hospitality and interior designer Alessandro Munge finally came to fruition – The Still Crafts, Drafts & Eats. 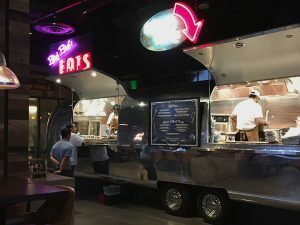 Described on their website as “the ultimate man cave with a dedication to craft beer, cocktails and mouth-watering food”, The Still boasts 22 TVs in an 8,000 square foot lounge and serves upscale bar food prepared in the kitchen of an Airstream trailer. While Airstream trailers used as food trucks have exploded in popularity over recent years, this is definitely one of the first times one has been spotted inside of a restaurant. This particular trailer just so happened to be abandoned in the hills of Tennessee where it was later acquired by The Still and named “Bud Bud’s”. The laid-back vibe of The Still can be largely contributed to renowned interior designer Alessandro Munge. He has worked on various projects in Vegas including some of the hottest venues like the Mirage’s 1 OAK Nightclub. Alessandro created a rustic-style space for this project, and part of that plan included two of Northwest Door’s commercial full-view aluminum doors with tempered glass. The versatility of these doors creates a perfect fit for any modern business ranging from restaurants to fire stations. Many of the restaurant jobs we have done use our doors to connect to outdoor seating areas, but they have also been used to sanction off areas like banquet or conference rooms. These specific doors were installed by McKeon Door in Las Vegas. Check out our selection of commercial garage doors today!